What do you do when your toddler is OBSESSED with all things that go? 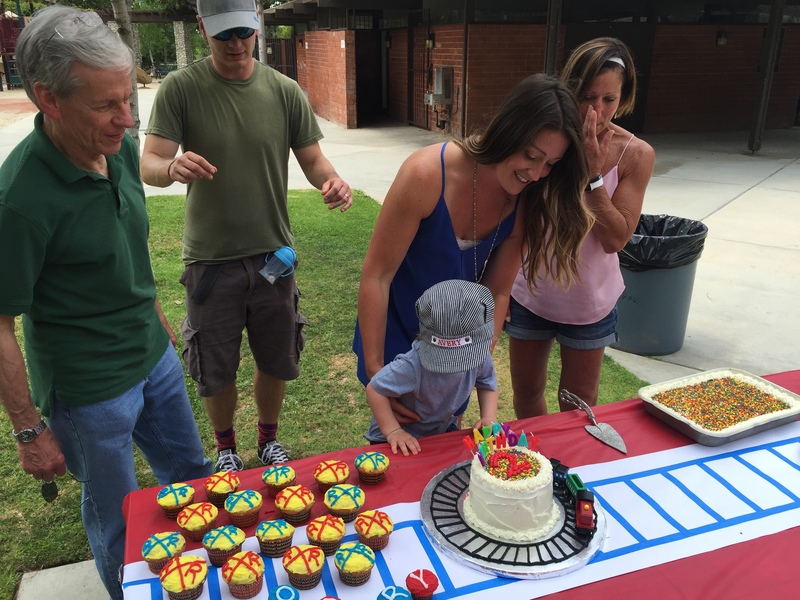 You have a train themed birthday party of course! 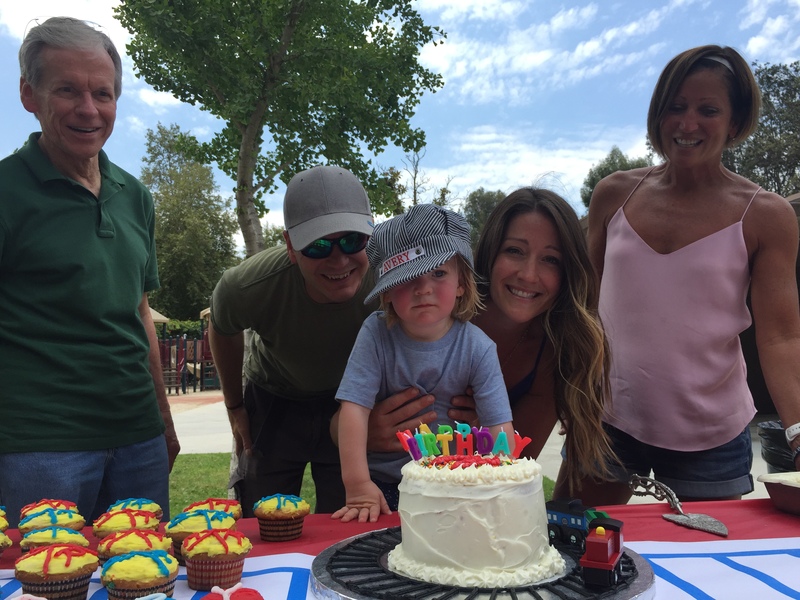 For Avery’s 2nd birthday we had a fabulously low-key “Choo Choo I’m two!” themed party. I was not quite as ambitious as his 1st Bday extravaganza, so I did just enough DIY to make it feel unique and special, but not so much that I was overwhelmed. We held it at the same local park we had his first birthday at. 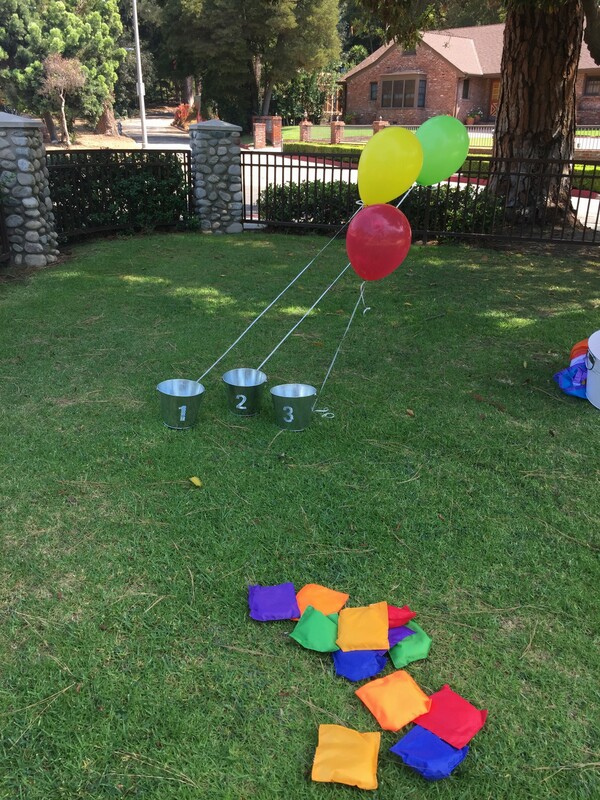 The entertainment consisted of three metal buckets and some bean bags to toss into them, a parachute, bubbles and a tub of plastic balls. 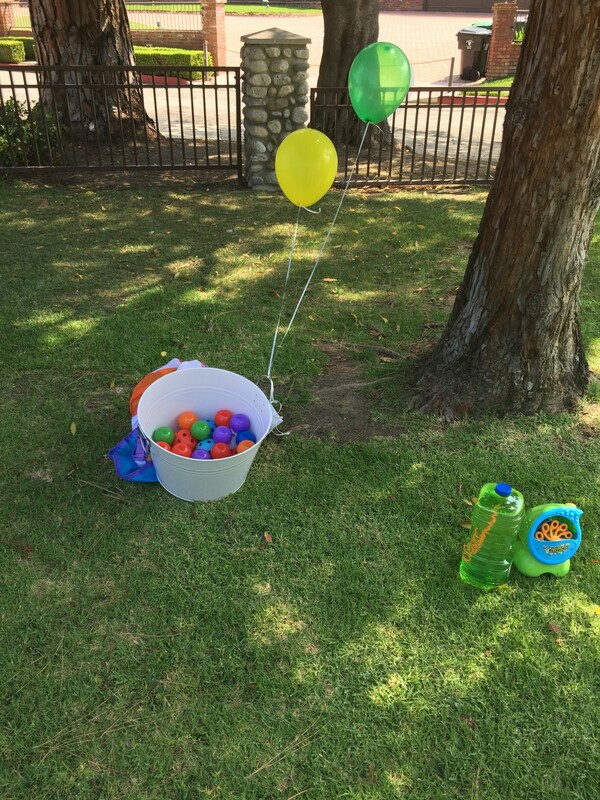 I could have just brought the bubble machine, because that was all any of the little ones cared about. There is something about massive amounts of bubbles floating through the air that just mesmerizes little ones and fills their hearts with pure joy. 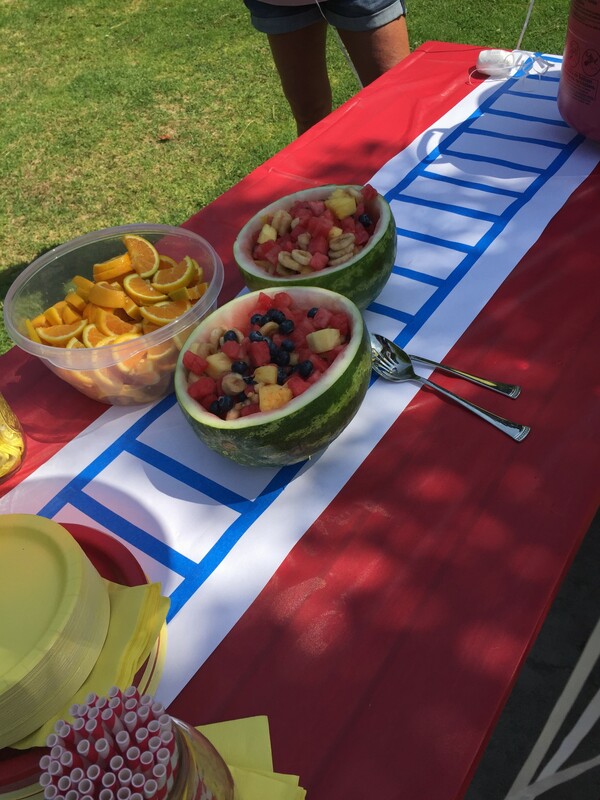 As for food, we had fruit salad, orange slices, lemonade and water. 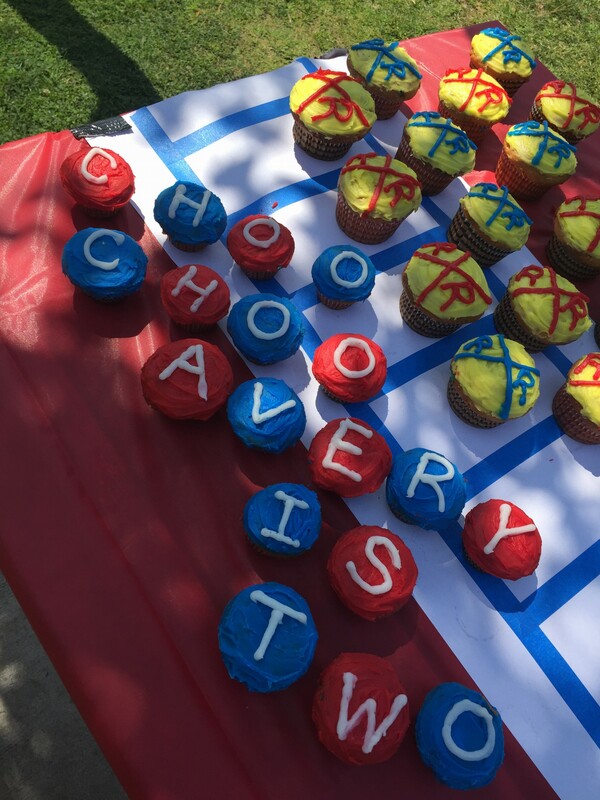 I baked some cupcakes and put railroad crossing signs on half and wrote out “Choo Choo Avery is two” on the other half. We also ordered pizza since the party was around lunch time. In hindsight I would have skipped the bananas in the fruit salad since after about 20 minutes they were black and mushy…not so yum. #lessonlearned. Every year I want to try and have a homemade cake for Avery’s birthday party. It’s something my mom always did, and I’m constantly looking for ways to find old school suburban life experiences for Avery. 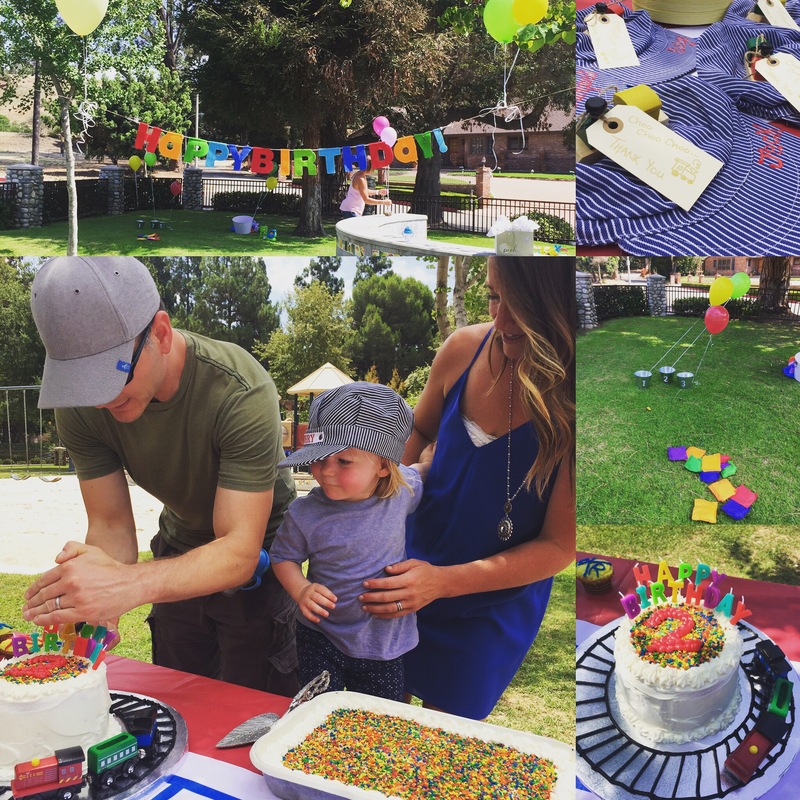 A laid back backyard birthday with a homemade cake is the embodiment of simple childhood traditions I desperately want for my son. 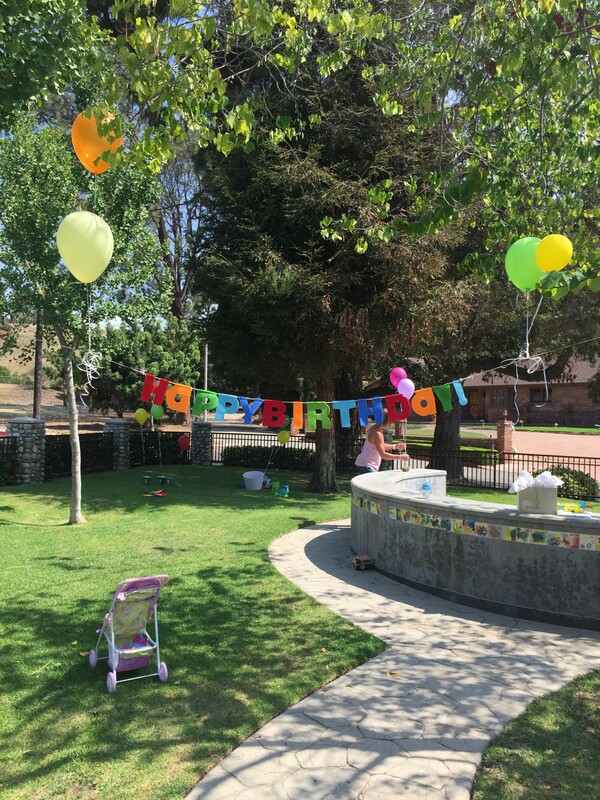 Since we don’t have a yard, a park is the perfect setting for relaxed birthday festivities. So in that spirit, I made a homemade cake (that was a disaster.) I managed to salvage the cake around 3am the day of the party. 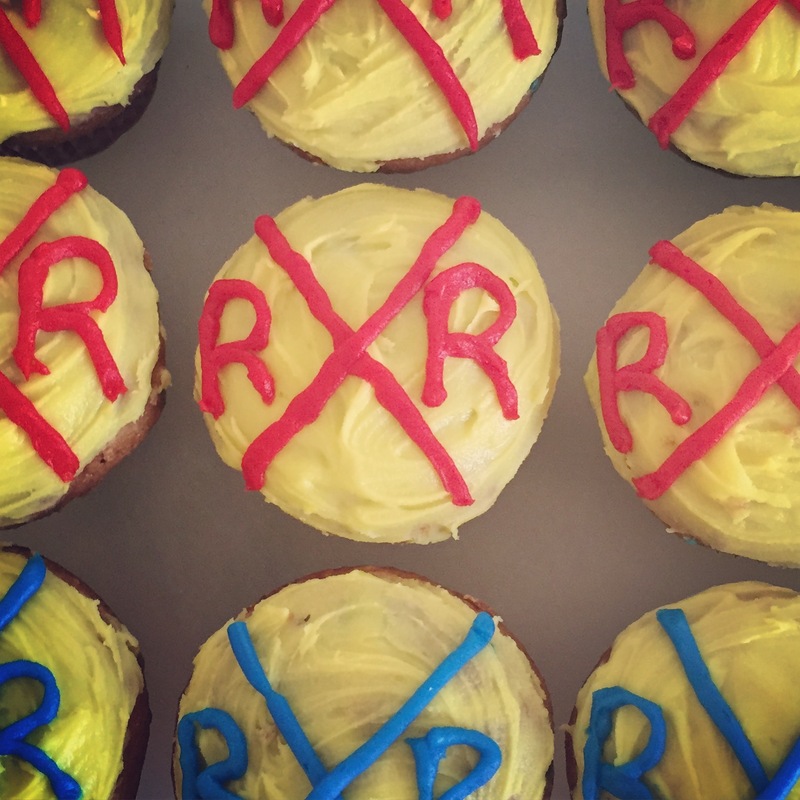 (I am NOT Martha Stewart in the kitchen, let’s let that be known…but my at least my artistic skills efficiently cover my lacking baking expertise.) Long story short, I baked 4 cakes. Yes. FOUR. The first three fell apart completely…we’re talking disintegrated into crumbs any time I attempted to frost. Finally with the help of my mom (thank goodness for moms!!! ), I was able to make lucky number 4 stick. 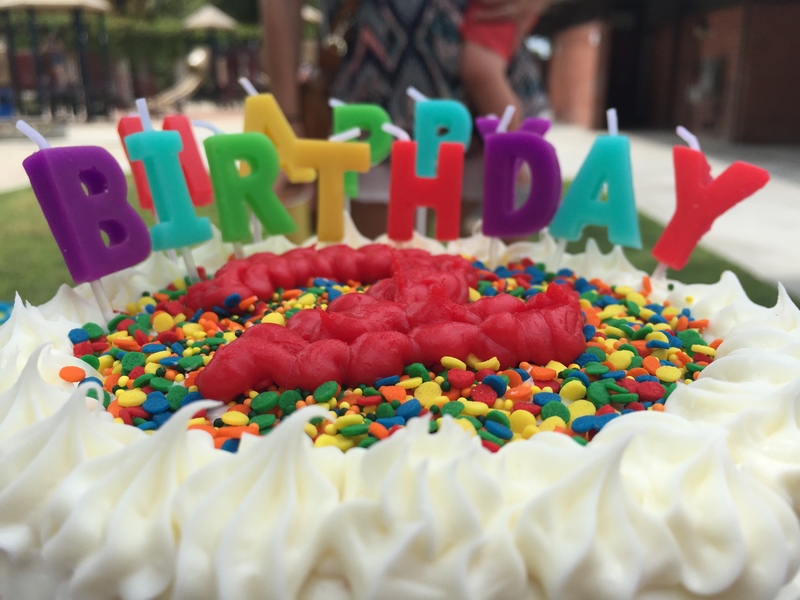 I covered the cake with vanilla buttercream frosting, filled the center with sprinkles, wrote a number 2 in the center and put on “Happy Birthday” candles. Then, on the cake plate I used black frosting to make a train track around the cake. 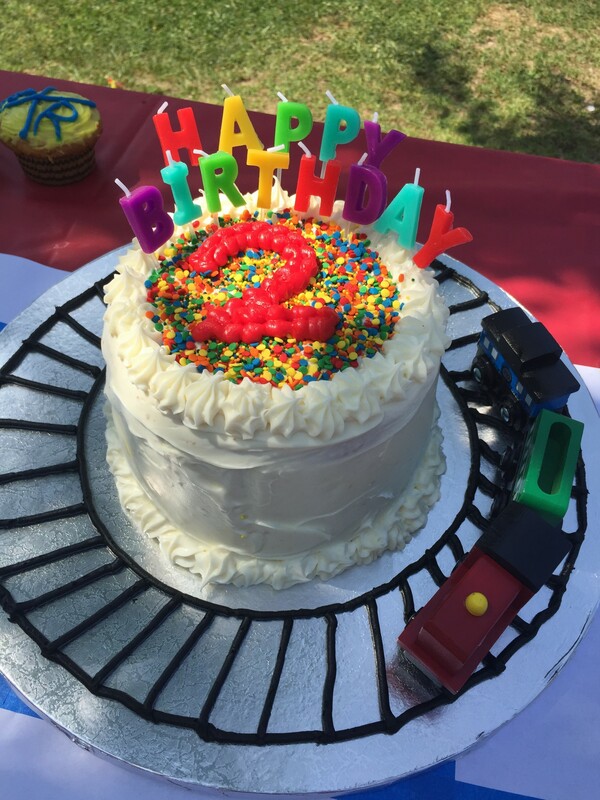 I placed a wooden train on the track going ‘around’ the cake. It probably wouldn’t win any flavor awards, BUT I think it turned out pretty cute in pictures. #babysteps. As for decor I kept it really simple. I found a great multicolored Happy Birthday banner at Target, got a helium tank and blew up some balloons to tie around the party. We used red tablecloths and then I used blue painters tape on some of his white art table paper roll to make a little railroad track. 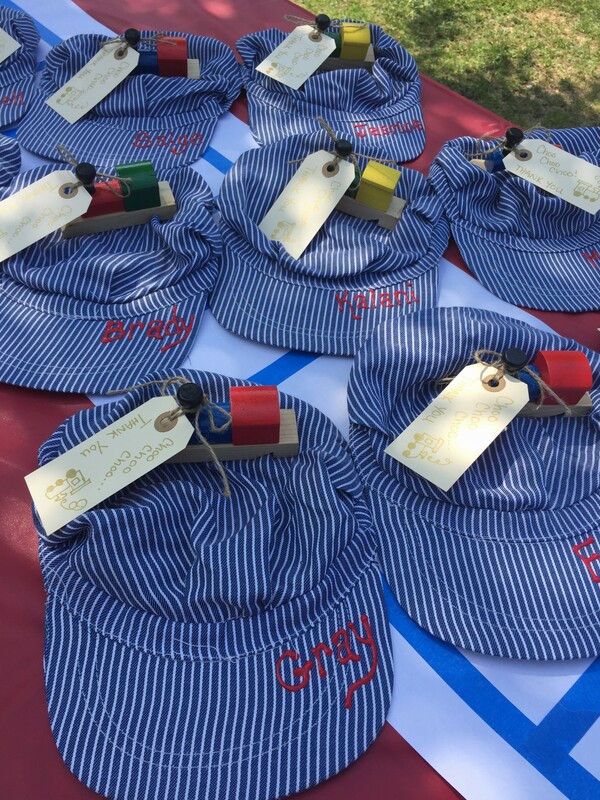 For favors I got railroad hats on amazon and used red puffy paint to personalize them. We also had Avery’s personalized conductor hat made by All Aboard Whistle on Etsy (and it is amazing quality FYI.) I found these adorable train whistles on amazon and tied a thank you note written in gold paint pen on a little gift tag from Michaels on each one. The party was a blast. Avery loved the train theme, the kiddos were adorable in their hats, and despite it being super duper hot, everyone had some good old fashioned sweaty fun. The shootings need to stop.